In recent weeks, oil prices have rallied, with Brent crude rising from $47.50/b to $53/b before turning downwards. 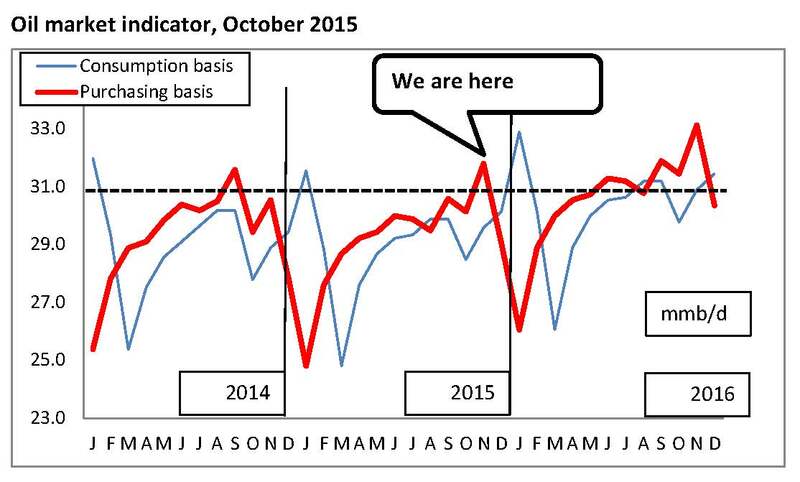 Some observers have seen this rally as an indicator of a secular upturn in prices. Others have interpreted it as an essentially seasonal move which can continue through the winter months. Both are wrong. Whilst the rally is indeed seasonal, it is already over. Always excluding shocks (such as military threats to production), the recent strength in crude markets is over, and is unlikely to return until April 2016 at the earliest. Though there are a lot of topics on my current agenda – such as rising strains in the financial system, the growing likelihood of global economic “regime-change”, and what I’m coming to call the “medieval-isation” of Britain – I think it’s desirable now to look at the outlook for energy, and for oil in particular. Let’s deal here with the short-term picture, where we have witnessed a “bull-trap rally” in oil markets that has been predictable for many months (indeed, I predicted it quite some time ago). The explanation for the seemingly-surprising timing of this up-blip – and the timing of its ending – lies in the difference between crude oil and refined products. Petroleum consumption is subject to seasonality, with peaks in the winter (when heating demand is at its highest) and in the summer (traditionally known as “the driving season”, though better thought-of as “the vacation season”, since it includes increased aviation demand as well). OPEC data shows the highs and lows of consumption for 2015 as the first quarter (a low of 91.9 million barrels per day) and the fourth (a high of 94.0 mmb/d). This variation becomes more pronounced when we estimate monthly rather than quarterly consumption, where the 2015 low is likely to have been March (about 89.6 mmb/d) and the high may have been either January or December (both about 95 mmb/d). The crude purchasing pattern, however, is critically different, and it’s this purchasing cycle, and not end-user consumption, which is reflected in crude markets. When we adjust for the time it takes for crude oil to be transported, refined and shipped as product, it becomes apparent that the seasonal timing shifts materially. Any crude purchased after November isn’t going to reach end-users before the winter consumption peak is over – indeed, refiners tend to plan maintenance downtimes for the early months of the year. Likewise, the pre-summer peak in crude purchasing finishes in June, again because refined product isn’t going to reach the customer until summer demand is tailing off. What this means for oil markets is set out in the first chart. This shows an estimated monthly call on OPEC crude, arrived at by deducting (a) non-OPEC production (and OPEC’s ex-quota liquids) from (b) estimated monthly crude purchasing (which of course excludes the processing gains which contribute to final product supply). The result is shown in red, whilst the faint blue line shows the number you would arrive at if you – mistakenly – made this calculation based on end-user demand, rather than purchasing. Superimposed on the chart is an indicative OPEC crude output level of 31 mmb/d, which is roughly where OPEC is. As the chart reveals, purchaser demand for OPEC crude currently spends most of the year below this indicative OPEC number, meaning that markets are over-supplied – quite how long this is likely to remain the case will considered in a later article. Such is the extent of structural over-supply that the pre-summer rise in crude purchasing does not move the chart into positive territory. 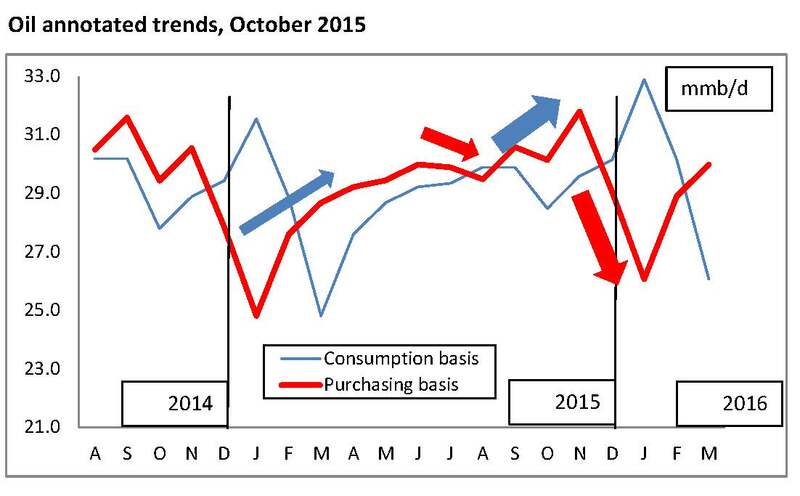 Purchasing does move above the line in October, but not for very long, and not by very much. This is why the recent rally has been so brief and, in relation to the intrinsic volatility of crude markets, so modest in extent. This analysis indicates not only that the recent rally is over, but also that markets face severe downwards pressure in the coming months. Of course, crude purchasers – who are perfectly capable of carrying out analyses like this one for themselves – may arbitrage the coming dip, which could put a floor under prices. But there is unlikely to be any upwards pressure in crude markets until late spring at the earliest. (This analysis does indicate a modest upturn in purchasing at year-end, but this may not happen – it didn’t last year – and isn’t going to take the line into positive territory anyway). The oil-market timing tool shown on the second chart is something I’ve been calculating for many years, and the basic features have remained largely constant – severe downwards pressures at the beginning of the year, a modest pre-summer upturn, and an equally modest downturn in the summer, ahead of the big autumn upturn. But the two summer events are pretty marginal affairs at the moment, meaning that the structural turns that do matter occur in autumn (upwards) and the winter months (downwards). In the near-term, the general pattern remains one of significant over-supply. What we need to consider in a future article are (a) the longer-term picture, and (b) the implications for other commodities and the economy.